Scientists are finding more Great Lakes birds with high levels of mercury in them. A recent report, Great Lakes Mercury Connections, by the Biodiversity Research Institute says the increased levels are particularly found in songbirds that rely on insects for food. Songbirds have not been heavily studied for mercury exposure, said Allyson Jackson, manager of the forest bird program at the Maine-based institute that researches emerging threats to wildlife and ecosystems. Until recently, mercury contamination was seen as a problem for water dwelling birds with fish-based diets. 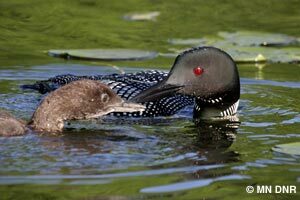 Studies of mercury in loons have been done for decades. Higher levels of mercury can cause brain damage, she said. And at low levels there tends to be a decline in reproductive success. The greatest risk for mercury exposure is still with aquatic birds, said Joe Kaplan, a researcher with Common Coast Research & Conservation, a non-profit loon research group in Michigan. Two factors impact how mercury will affect a bird, he said. One is the amount of mercury they’re exposed to and the other is the birds’ sensitivity to the metal. Loons will always be exposed to more mercury than songbirds because of their fish diet, Kaplan said. However, loons have a low sensitivity to mercury compared to their woodland-dwelling counterparts. Kaplan said the reason songbirds have elevated exposure could be from eating insects associated with aquatic environments. And they may not be able to release the mercury through their feathers like loons do. Loons get rid of mercury through their feathers just like humans do through their hair. For birds with high sensitivity, he said, this is probably not the case. Research of problems for songbirds with high levels of mercury is an on-going process, according to the institute. Mercury can be particularly harmful when birds migrate, Kaplan said. Migration is the most physically demanding time in a bird’s life, Kaplan said. The Hidden Risks report said it accounts for nearly 75 percent of all annual mortality rates in some songbirds. Feathers stop growing during this time. A bird needs to complete a migration before it can molt and release some of the mercury. Depending on species sensitivity, this is when most problems occur. We can lose mercury through our hair? So bald guys are screwed? nothin personal.